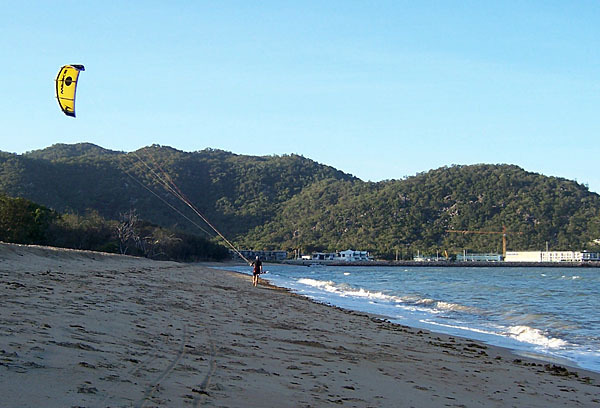 Nelly Bay is really the only spot on Magnetic Island that works well in the prevailing Easterly winds. Geoffrey Bay works in the winter SW and S winds, and Horseshoe Bay catches the summer NNE, N and NNW winds. Nelly Bay is within walking distance of the ferry terminal and provides a good combination of flat water and waves during the right conditions of wind and tide. However – this is an intermediate to advanced location, not suitable for beginners. If you cannot self launch and land, and stay upwind easily, then you SHOULD NOT KITE HERE. There is a shallow coral reef bottom which starts right off the sandy beach, and there are trees along most of the shoreline, so walking the kite back upwind is dangerous. Power lines and roads are other nearshore hazards. E to ENE’ly in the afternoon (2pm-dark) is the main wind direction, cross onshore port tack. If the local waters forecast is at least 15-20 knots then you should get at least 12-15 knots of useable wind at the beach and another 3-4 knots once you get out near the reef edge. In a strong wind warning expect winds 20-25 knots with some higher gusts. Sustained winds over 30 knots are rare. The AIMS weather station is 1.5km from the site and updates every 6 hours. The site at Townsville airport (10km away) updates every 30min but the wind strengths are not always the same, especially in gusty conditions. ESE is straight onshore – use caution on launching and landing, and kite upwind out to near the reef edge before attempting any jumps. During trade wind periods, SSE and SE winds often occur in the morning in winter (dawn till 10am) and these winds are cross onshore starboard tack. They fade before lunchtime, swing to E or ENE, and then pick up again after 2pm. Pump up on the grass at the old helipad halfway along the beach, and then launch on the beach nearby which is clear of trees. During launch, be aware that a road and high voltage powerlines run about 100m behind the launch site. Be ready to use your safety systems. In E and ENE wind, kite upwind after launch into the northern corner of the bay for the cleanest wind. Beware the wind hole in the southern part of the bay due to the nearby hill – Avoid this part of the bay (marked in red above). 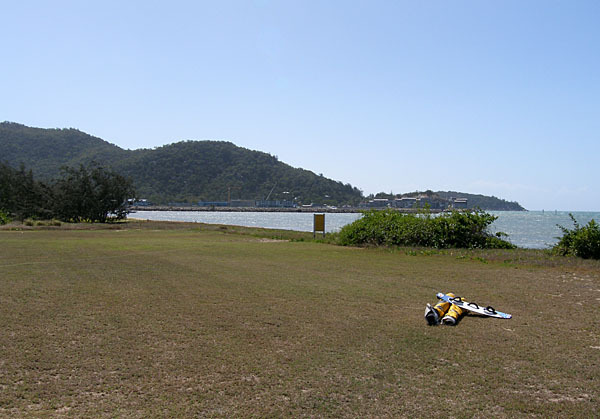 You need at least 1.1m tide to cover the reef flat in order to kite here, and best tides are 1.2m to 1.8m. Higher than 2m and it gets a bit choppy, but still rideable. Bring booties if you plan to kite on tides lower than 1.2m or do any standing on the reef bottom. Check the tides before you come. You will find fairly flat water in the north end of the bay near the harbour wall, and wind waves will break left on the reef edge along the whole length of the bay (see below). Beware of the ferries regularly using the Nelly Bay harbour, and stay clear of the marked channel. The ferries pass east (seaward) of the black cardinal mark visible from the beach. DPI shark set lines are located on a series of marked buoys some 100m seaward of the reef edge. Avoid crashing the kite near these or you may get tangled. There is a freshwater tap near the old helipad but no toilets. 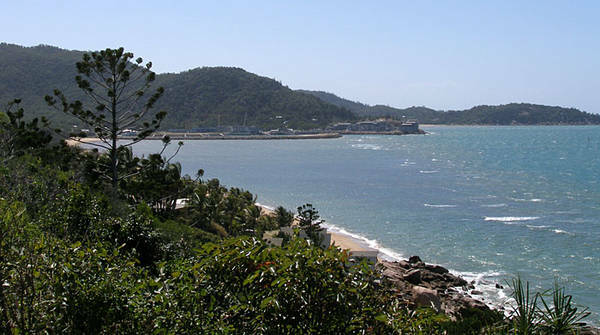 Nearest toilets, bar, accommodation and other essential facilities are located at the X-base backpacker resort at the southern end of the beach. You can get mobile phone reception at the beach. Looking north into Nelly Bay, with the smooth water over the reef flat clearly evident. Geoffrey Bay is the only location that can be ridden in NQ on a SW and Southerly wind direction. Mid tide is the best for flatwater.